The Kollel Tzioni is our flagship Shlichut Model. The Kollel is typically comprised of at least one couple, including a Rosh Kollel, together with 2-4 ‘bachurim’ (young men who have learnt in Hesder Yeshivot or Mechinot and have completed their army service). 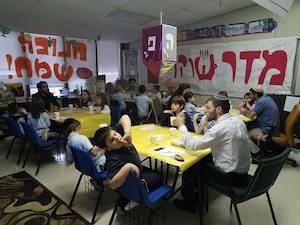 The heart of the Kollel is the Beit Midrash, and the Bachurim have a daily seder, led by the Rosh Kollel. The internal learning serves as an example of our commitment to Torah learning to the community, and also insures the shlichim’s continued spiritual advancement. Through Torah study, teaching (formal and informal) and outreach, Torah MiTzion shlichim are able to impart their love for learning, for The State of Israel, and for their fellow Jew to all ages (from grade schoolers to golden-agers) in their host communities. 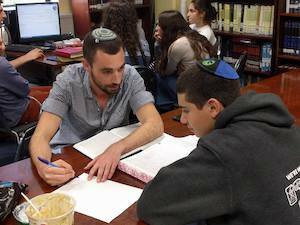 The Kollel model is designed to reinforce Zionist Jewish identity and strengthen Torah knowledge among all sectors of the Jewish community. The Torani-Tzioni Center’s team of shlichim are specially recruited and trained in Israel in order to arrive as a cohesive group ready to impact their host community. Their home base is typically in the local high school, though a synagogue or community center may also serve as a fitting host location. 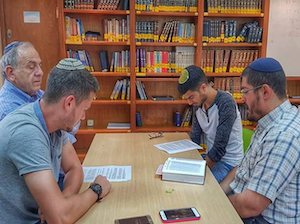 The Rosh Kollel and his wife both serve in leadership rolls, ensuring that their team of shlichim remain active in initiating programs and conducting learning sessions with a wide cross-section of members of the host community.